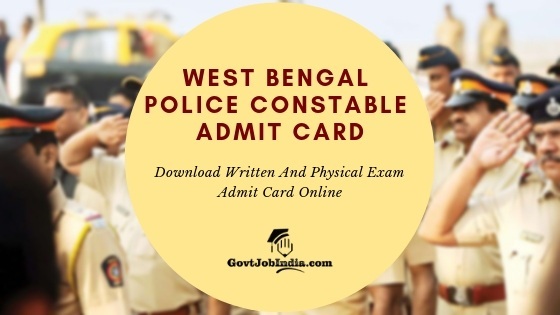 West Bengal Police Constable Admit Card 2019: Candidates who have applied for the recruitment are advised that the West Bengal Police Constable Admit Card 2019 will be uploaded on the website of the WB Police Force very soon. All candidates can download their WB Police Constable Exam Call Letter from the link on this page. The West Bengal Police Constable Exam will be conducted throughout the state of West Bengal to recruit capable candidates for the post of Constable (Male). In order to get selected, however, you have to go through the West Bengal Police Constable Recruitment Process. All the details regarding the recruitment process have been provided below. All the information you need regarding the West Bengal Police Constable Admit card will be provided on this page. We are constantly updating this page with the latest news and information regarding the West Bengal Police Constable Admit card, Exam Dates and Exam venues. The West Bengal Police Constable Admit Card has not yet been released by the West Bengal Police Force. We request that you revisit our page on a later time for all the latest news and information about the WB Police Exam Admit card. Tentatively, the admit card should be released about 10-14 days before the exam is conducted. Since the West Bengal police have not yet specified the exam date for the exam, it is difficult to speculate the exact date of the Admit card release. We would like to notify you that you can download the West Bengal Police Constable Admit Card can be downloaded from the link provided below. The link can be used as soon as the admit card is released. The candidates will have to go through a 4 stage recruitment process for the West Bengal Police Constable Recruitment 2019. Candidates are reminded that it is absolutely necessary for them to pass all stages of selection in order to be deemed eligible for selection. Kindly check out the detailed selection process provided below. The details regarding the next stage of the recruitment will be provided to the candidates at the conclusion of the previous stage. Keep in mind that you can visit this page as we will be providing the latest information about each stage at the end of the previous stage. Want to download West Bengal Police Constable Admit Card? Follow these easy steps! On the website, proceed to the downloads section. Within the downloads section, look for the link regarding the West Bengal Police Constable Admit Card 2019. The ‘Download Admit Card’ link will only be available after it has been released. Once you click on this link, you will be required to authenticate yourself. After finishing the authentication process, you will be able to download your West Bengal Police Constable Admit Card 2019. Don’t forget to take a copy of the admit card soon after you download it as you will be expected to carry this document along with you for your Written Exam. We hope all the information provided here regarding the West Bengal Police Constable Admit Card 2019. Make sure that you visit our page from time to time for all the latest news and information regarding the WB police Constable Written Exam, Physical Exam and Admit Card release date 2019. All the best for your West Bengal Police Constable Exam 2019.